Today I have a fabulous photo shoot with Rosie Button Photography collaborating on some really fabulous ideas. Contrary to what most people may think, a photo shoot and the preparation can be quite a lot of work, I thought today I’d give you an insight to how you can prepare for a photo shoot. When you’ve found the perfect photographer, if you’re doing a photo shoot for collaboration, or even for fun its very important that you both agree to what you’d like to get from the photo shoot, what you ideas are, and most importantly your boundaries, while there are a lot of amazing photographers out there, there are also a few bad apples. Get in a healthy routine, eat regularly and healthy food, drink lots of water, and exercise. If you feel great, you’ll look great. If you need to provide an outfit plan it out, source your items, try them on, make sure its exactly the aesthetic you desire. 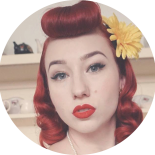 Practise poses and facial expression, while most photographers will be able to help you, especially if you’ve booked a photographer who specialises in pinup, but if you know what you’re doing you’ll get a lot more from your shoot. If you don’t already cleanse, tone and moisturise your skin daily, start doing this now, it will help you keep your youthful look, reduce blemishes, and make makeup application so much easier. Practise hair and makeup, and specific practise the look you’ll be creating on the day if you don’t have a makeup artist. Keep inspired, look up pinups, and watch old movies. Make a check list of everything you need to do, and everything you need to bring with you, the last thing you want to do is forget the new outfit you’ve bought specifically for you glamorous time in front of the camera! Try everything on again, make sure everything is fitting perfectly, you may even notice you need another accessory, or a different pair of shoes. Get a good night’s sleep, aim for 8 hours, so you’re well rested and well prepared. Please eat, starving yourself before a shoot will not make you magically thin, it will only make you feel tired, irritable, hungry and probably make the shooting experience so much less enjoyable. Eat fresh fruit, vegetable, complex carbs, it can be good to avoid foods that make you bloat 2-4 hours though. Drink lots of water, drinking water will help with your skin look beautiful. Don’t forget to shave if its that pinup perfect look you’re going for, its a nightmare of mind going to shoot and having hairy armpits in photos. If you’re not having your nails professionally done, paint them after you’ve done chores like washing the dishes, otherwise you may find they’ll chip off! 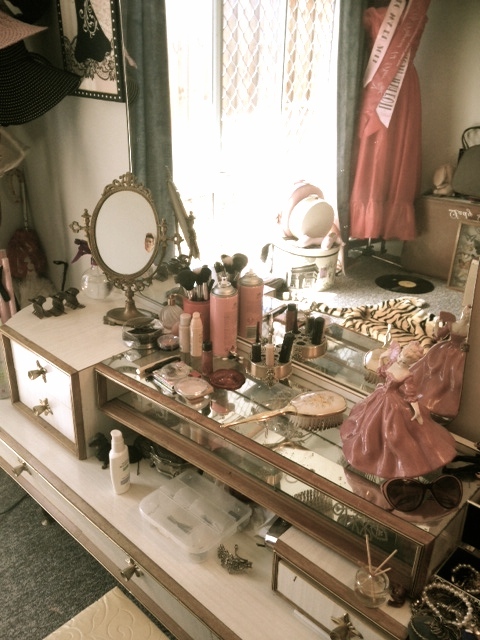 Preparation is essential, I set up my makeup area so I know I have everything to get ready. Be sure to be punctual to your shoot, your photographer may have another client after you. Bring water, and a muesli bar in case you get hungry. My makeup set up for today. Bring perfume to put on right before your shoot, a glamorous scent will make you feel like a million dollars. Match your nails (feet and hands) to your lipstick, this will give your a very authentic pinup look. See if the photographer has music to suit the shoot, or bring your own, it will help you feel fabulous. Tell yourself you’re beautiful, because you are. Relax and enjoy your photo shoot, its so easy to stress, but when we stress we don’t get as much from our photos, we look more nervous, and enjoy the whole experience less. 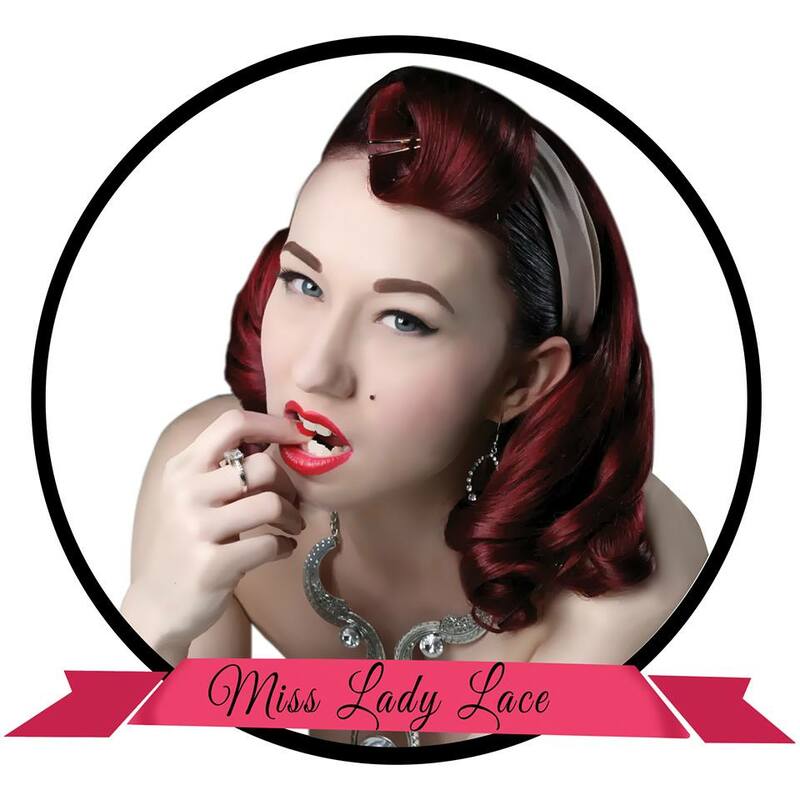 This entry was posted on October 8, 2014 by Miss Lady Lace in Uncategorized and tagged 1940's, 1950's, 40s, 50s, burlesque, burlesque photo shoot, Lady Lace, miss lady lace, pinup, pinup advice, pinup girl, pinup life, pinup photo shoot, pinup tips, retro, rosie button photography, victory rolls, vintage, vintage glamour.